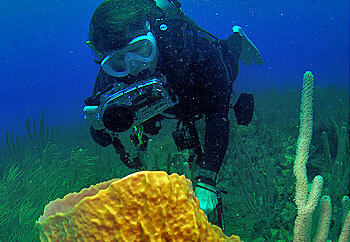 The Scuba-Diving in Grenada is among the most scenic in the Caribbean! From lazy drifts over beautiful coral reef, amidst schools of jacks and creole wrasse, to a sharp plunge to the dark and mysterious wreck of ‘The Bianca C’, (The largest shipwreck in The Caribbean). Whether you are novice or very experienced divers your needs will be catered for. A selection of training courses is available including Full Certification, Referrals and Resort Courses. At Native Spirit we were born and bred exploring these waters and would love to help you discover some of what we have grown to love so much. Click here to listen to our radio interview with Joseph Cocozza of Pod Diver Radio, the Scubacast. With a certified PADI Dive-instructor and Dive-master at your disposal, you can be diving sooner than you think! Our boats can accommodate between one and 16 divers each, and you will always be guided by one (or more) of our professional divemasters/instructors.